The squadron is run by a team of adult volunteers, but how much do you know about each of them? How would you describe your role? What are your usual duties? I am mainly looking after the Adventure Training side of the squadron, particularly The Duke of Edinburgh’s Award and navigation work. I’m heavily involved with the practical part of DofE. What is your occupation outside of cadets? I am a Production Manager, designing buildings and emergency service vehicles – primarily the ambulance; it can be quite a challenging role which I have been doing for 21 years. 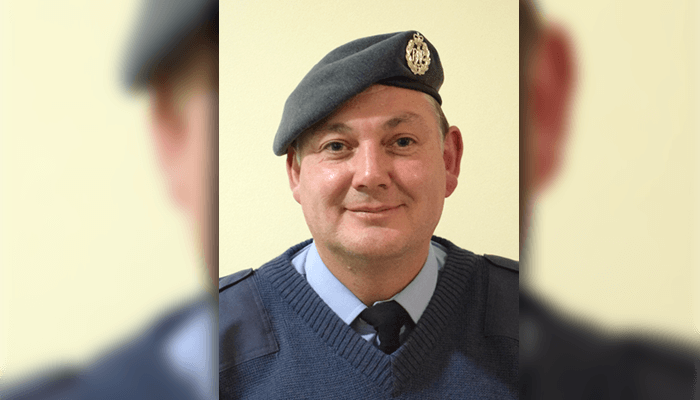 How did you find out about the RAF Air Cadets? I initially found out about the RAFAC through my son who at age 13 wanted to join the Air Cadets at either Stafford or Cosford. Since Cosford had an airfield, he came here. As Cosford was a while away from home I spent 2 hours each parade evening waiting in the car with a book. It was only until Warrant Officer R. Lofthouse (Sergeant at the time) suggested becoming a staff member, I became a part of the squadron. How did you become a staff member? I started off as a Civilian Instructor (CI) at Cosford Squadron. Whilst being a CI, The Duke of Edinburgh instructor retired. So I began to get qualifications including a BELA in 2005 at RAF Akrotiri (No. 1 (Overseas) Squadron in Cyprus). Since the BELA, I thoroughly enjoyed getting more involved in adventure training with the cadets. I also got qualified on a mobile climbing tower, enabling cadets to go rock climbing. I spent 4 years as a CI and had no intention of going into uniform until I was persuaded by the previous Commanding Officer. Seeing young cadets with no experience and understanding mature and develop and leave as well-rounded young adults. What are the main challenges? What have been your largest hurdles you’ve had to overcome? Being able to find the time to dedicate to cadets along with full-time work, I try to keep 1 week’s worth of holiday a year for cadets. What do you gain from volunteering as a staff member? I gain a huge sense of achievement seeing cadets pushing beyond comfort zones. Is there anything you would like to change about our squadron? No, with a dedicated group of cadets, everything pulls together. What have been your highlights and best experiences? I took cadets to Morocco to climb the highest peak; cadets overcame illnesses and achieved what they needed to. Were you a cadet yourself? No, but my father was an instructor of sea cadets which opened me up to roles within cadets. What would you like cadets to know? Do you have any advice? Grab every opportunity that comes your way within cadets as you only get out of cadets what you wish to put into it. What would you like cadets to do for you? Are there any further ambitions you wish to achieve? Short term, I’d like to address the position of DofE Supervisor, I’m just waiting for a course opportunity. I’m also looking forward to working alongside Sergeant S. Jones to do Radio Communications.